This morning was one of the rare sunny and clear mornings that I have seen so far this season. Paul and I headed off early to meet with Thierry Avrillon, engineer and skibike builder and his friend and riding buddy Laurent. 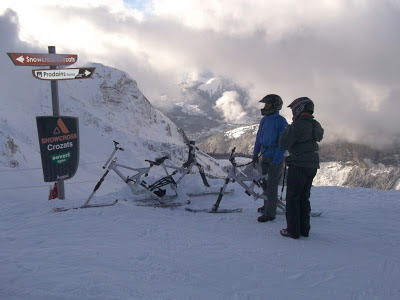 I had suggested riding in Avoriaz, as I couldn't face any more runs on the Grand Massif at; Les Carroz, Samoens, Morillon or Flaine, having been there so extensively in recent weeks. Thierry accepted my suggestion for a trip to Avoriaz even though, for him, it would mean a longer drive of nearly two hours. 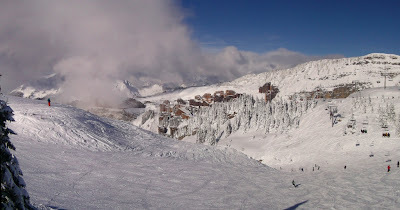 We met in the car park at Les Prodains and used the large cable car to ascend to Avoriaz village. 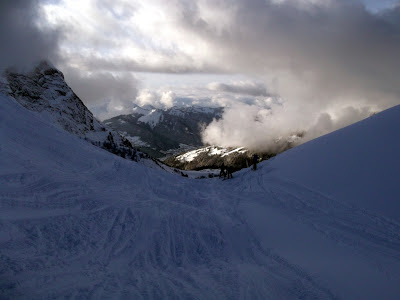 We made a tour of the pistes and a fair bit of the excellent soft deep snow off-piste too. Great though all this was, my outstanding memory of the day will be our "last run". I had foolishly suggested we try out the SnowCross Crozats run from Les Haut Forts all the way back to the parking area at Les Prodains. A wild "back mountain" style off piste descent of nearly 1500m or 4500ft by my reckoning. Both Thierry and Laurent seemed up for it and I was feeling bullish. At the start there was a huge bowl area, it looks extreme, until you realise that you can put as many gentle traverses back and forth as you wish. This section rated as the most exhilarating skibike riding I have ever experienced and it made me realise just how restrictive piste riding is by comparison. Further down Laurent took a route to our right, disappearing over a ridge, whilst Thierry and I followed another skier towards a clearing in the woods. This rapidly became; narrower, steeper and with moguls the size of cars. Whilst there was still soft snow it was manageable, but when the hard snow and ice appeared the trouble started. I knew things were getting grim when I saw Thierry get off his skibike and start sliding/walking down a section. To one side there was a frozen waterfall hanging off a sheer cliff face with the sound of a fast flowing stream somewhere below it. To the other side was a dense thicket of trees. I struggled on, but then suddenly I was slipping, sliding and tumbling down a steep icy slope. With limbs flailing, I was engaged in a risky dance with the skibike. I hit something very hard with my head and stopped to find myself with a leg through the frame. Miraculously, I didn't end up in a gorge, nor hit any trees, but that had been a close call. 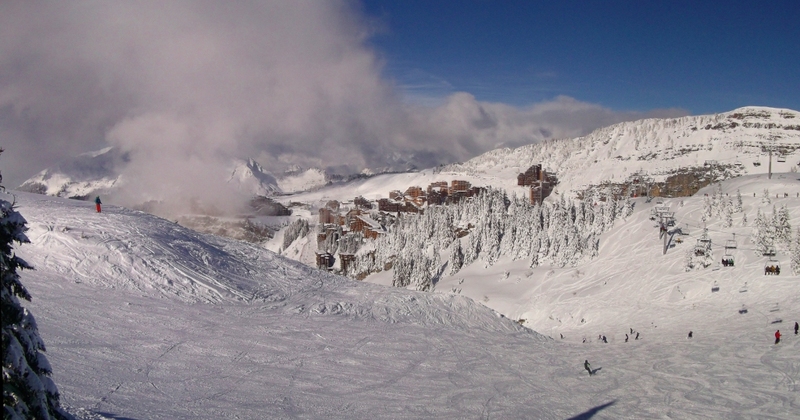 The Avoriaz piste plan lists this area for "experts only" and they aren't hyping it up. Snowcross Crozats - ideal for "experts only"
Slowly picking my way farther, I resorted to sliding face down some sections with my skibike, digging the end of the handlebars into the snow, like a pick axe, to brake my descent. I don't expect this technique will make it into a teaching manual, but, there were few options left for me to get home. Just when the situation was looking endless, the blue run down to the car park became visible, we had made it back to safety and Laurent patiently waiting for us. He had encountered similar challenges, including a painful tumble after hitting a tree. The result was the handlebar ends smacking his knees. His humiliation was compounded by the need to climb back up 30m or so to recover his skibike. Both Thierry and Laurent deserve a medal for bravery in adversity and thanks for not blaming me for taking you on such a challenging route. They bade me farewell in French using the words for "till next time", rather than "good bye".